There's been a gradual shift at Riviera, away from traditional shaftdriven boats to pod drives. The builder is now fully committed to the pod propulsion system and all new models are being designed around the benefits that they provide. Primarily, it's the extra space onboard, ease of handling, performance and efficiency. Riviera currently builds 20 different models and now it's only the 63 and 75 that are still being built with shafts, and both of those feature the optional Twin Disc Joystick Control system. Since venturing down the pod path, Riviera has mainly utilised Volvo Penta's IPS system with joystick docking and counter-rotating forward-facing props. However, there is a segment of the market, primarily owners who have grown-up with shaftdrive boats, that isn't comfortable with forward-facing props. Riviera is now addressing that situation by offering an alternative on a handful of their larger, popular models. That alternative is the Zeus-ZF 4000 pod drive, coupled with Cummins engines. The Zeus system features rear-facing props and a tunnel-mounted design that protects the drive from underwater debris. The Riviera 5800 Sport Yacht and the 53 Flybridge, both fitted with the triple 435hp Volvo Penta IPS600s as standard, are now also being offered with twin 900hp IPS1200s, or triple Zeus with Cummins engines. So now, whether you prefer two engines or three with rear-facing props protected by the drive leg, or forward-facing props that run in clean undisturbed water, are all now your choice! <I>Trade-a-Boat</I> was invited to tag along for part of the sea trials on the first of these two models to be fitted with Zeus and it's fair to say, we were impressed. There's a different underwater hull shape required for each system, IPS requiring a smooth hull and no keel so the forward-facing props can operate in undisturbed water. Zeus drives, on the other hand, operate in tunnels and the hull features a small keel that tapers off gradually going forward. Riviera has addressed the issue of different underwater shapes in the same hull by having a single mould with a standard deadrise and dropping a plant into the mould to change the shape, dependent on which system is being used. The Cummins engines powering the Zeus legs have higher exhaust risers; consequently they don't fit under the cockpit floor in the same position as the Volvo Pentas, and sit more forward in the engineroom. That doesn't affect any of the accommodation; it just means the engines take up some of the space that would otherwise be storage, engineering room, or even crew quarters. The cockpit floor has been redesigned to incorporate a couple of large storage tubs to compensate for the loss of space forward of the engines and, if anything, there is now even more storage than before. Moving the engines forward, away from the pods, also means that jackshafts are used to connect engines and drives. Automatic inbuilt trim tabs are a feature of Zeus. They're programmed to apply incrementally as the boat increases speed and can also be programmed to come on hard as the boat accelerates onto the plane and then retract automatically to a cruise position dependent on speed. In practice the system works well, although it doesn't take into account sea-state. So for those times when conditions dictate that auto tabs aren't practical, a single touch of the trim button disengages the system allowing the skipper to set the tabs manually. Called Vessel Personality, it's pre-programmed at the factory. Another inbuilt benefit with Zeus is Skyhook, and it also comes standard. At the touch of a button the drives will hold the boat in one position, irrespective of any wind or tide. A practical and handy feature, it's ideal if your waiting at a busy fuel dock, preparing lines or fenders before going into a berth, or even while fishing over a reef. Skyhook is also available on IPS, but it's an option. The triple Zeus drives are coupled to 600hp Cummins QSC engines. These are the same motors that would be used in a normal shaftdriven boat, the only difference being there's a drive plate and a coupling to connect to the shaft linking the engine to the pod, as opposed to a gearbox mounted on the engine. Here the gearbox is integrated within the Zeus drive. The only other difference is the exhaust. This exits through the pod and out through the centre of the props, similar to a sterndrive with a bypass muffler out through the side for low-speed work eliminating any burbling under the hull when docking or operating at low speed. These bigger engines provide more torque and a higher top speed than the standard 435hp IPS. The Riviera 53 recorded more than 33kts, whereas with the standard IPS she's a 29 to 30-knot boat. The Zeus-Cummins option on the 5800 produced almost the same top speed. With that sort of performance, you need to constantly remind yourself that these are big boats. Tests indicate that there's not a lot of difference in fuel consumption between the two systems, using about the same amount of fuel at cruising speed, the difference might be two or three knots at similar RPM in favour of the Zeus-Cummins combo. Where you're likely to notice a difference is when the boat is fully loaded and full of fuel and water, the bigger engines won't be affected as much in terms of performance, whereas with the smaller engines, as you would expect, there's likely to be some performance drop-off. Priced at about $90K more than the triple Volvo Penta IPS you need to factor in that Zeus comes with integrated autopilot, Skyhook and joystick in one, as well as a second station with the package. Taking all that into account, it ends up being about a $65K upgrade. 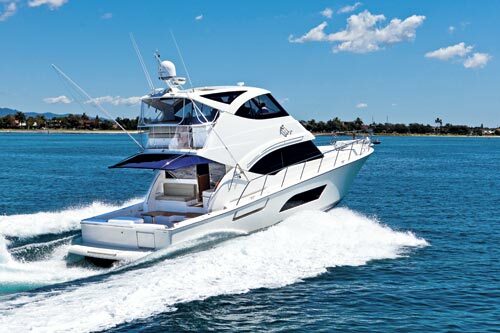 Both the 53 Flybridge and the 5800 Sport Yacht are truly impressive boats. When we first tested the 53 hull no.1 back in <I>Trade-a-Boat</I> Issue 416, soon after her world release at the Sanctuary Cove International Boat Show last year, we said she was "the most exciting Riviera in years". That boat, just like the 5800 Sport Yacht, has enormous volume, huge living spaces, and a full-beam master stateroom with king-size bed and large en suite. That's the reason we dubbed her back then as the "Space Ship", that and the fact she, again like the 5800, uses space-age systems, fly-by-wire technology, computer-controlled engines and CZone (an integrated CAN-bus switching system that combines all of onboard AC/DC components into one simple, intuitive operation, all controlled from a single screen, or, in the case of these two boats, from two screens, either at the helm or in the saloon). Both of these boats use hulls designed with state-of-the-art 3D CAD software and constructed using resin-infused moulding technology rather than traditional open moulded lay-up of fibreglass and resin. The result is consistent hull thickness, reduced weight and improved ratio of glass fibre to resin resulting in greater strength. The Riviera 53 Flybridge is a big boat in any sense - big in volume, big on performance, big on luxury. Her hull lines run straight aft from maximum beam, creating a powerful lift and planing surface providing great stability. She's got exceptional freeboard with a bow considerably higher than some of Riviera's larger earlier models like the 61 and she has more flare in the bow so runs dryer. There are lots of places to relax and lounge about onboard, with a huge cockpit featuring mezzanine seating and an inbuilt barbecue. A sliding door and hopper window provide loads of fresh air and light, while the stylish galley, located aft to port, is fitted out with quality European appliances. Forward of the galley the well-appointed, luxurious saloon features 360-degree views courtesy of large side windows and a huge windscreen. The flybridge is available in two options, with the helm forward for cruising, or aft that's more suited to sportsfishing. A well laid-out helm either way, with twin pedestal chairs for skipper and companion, plus a separate lounge to starboard. To port there's C-shape seating around a table that accommodates six with a wetbar opposite. This is a magnificently appointed sky lounge, topped off with an electric sliding sunroof and opening side windows. The engineroom is easily accessible, with plenty of room around all of the equipment for servicing. The pod-drive arrangement frees space amidships, which Riviera has used exceptionally well in the form of a luxuriously appointed, large master stateroom with en suite. Forward of the master is a guest stateroom incorporating queen-size bed, while a third cabin has two large single berths. An en suite bathroom to the guest cabin doubles as a dayhead. Ample storage and hanging space throughout means packing all that gear for extended time away isn't a problem. 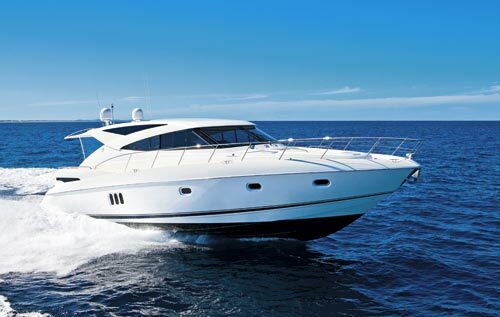 The Riviera 5800 Sports Yacht was originally launched in May 2009, designed and built around IPS pod drives. With 23 launched to date, this is a popular model for Riviera and it's not hard to see why. The design expands on the indoor/outdoor character and the sense of light and space introduced on the very first award-winning 3600 Sport Yacht, that's been carried on in the 4400SY and 5000SY. The greater volume has also allowed Riviera to take the design to a new level of sophistication. Sleek and stylish European looks, generous four-cabin and three-bathroom accommodation, as well as the single-level living saloon, aft galley and cockpit have resonated with customers both here and overseas. Riviera will personalise these boats for customers, and on the boat we looked at the fourth cabin had been stylishly converted to an open-plan office. Not just any sort of office mind you, they've completely opened up the area around where the fourth cabin would be at the bottom of the companionway flooding the interior with light. The owner, a marine engineer who's owned a series of boats, including three previous Rivieras, intends to spend a lot of time onboard. He's also specified a workshop/store, built into the engineroom that looks like an engineer's dream. Both the Riviera 53 Flybridge and 5800 Sport Yacht are two, big, magnificent boats, finished just as you would expect from builder, with well-designed layouts, beautiful timberwork, quality fabrics and the latest technology. On the day, we got to drive the 53 but unfortunately ran out of time to get behind the wheel of the 5800. Nevertheless, we've tested both boats before in <I>Trade-a-Boat</I> and we've said good things about the way both hulls perform at sea. This time was primarily about checking out the triple Zeus-Cummins option and what we saw, we liked. Better performance, better top speed, more torque than the triple Volvo Penta IPS600 option, with things like Skyhook, auto trim tabs and second helm station all included in the package. On the downside, they take up a bit more space forward in the engineroom and then there's the cost factor. I think Riviera has made a wise move here by offering customers a choice of three propulsion systems - these two popular models will appeal to an even broader section of the market. 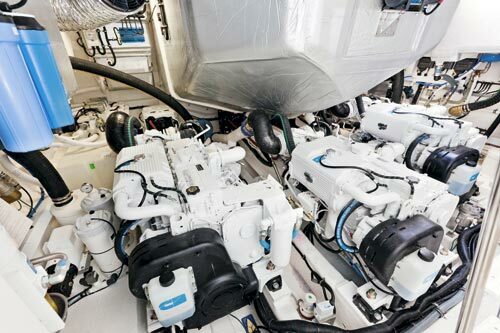 Triple 600hp Cummins engines with Zeus pod drives (inc. electronic controls, joystick and Skyhook), electronics package, forward helm location with aft flybridge docking station, high-pressure water-cleaner system, drinking water filter with outlet in galley, extra 30m anchor chain (total 100m), single-boom Davco davit, outriggers, five rodholders in cockpit coaming, teak-laid cockpit floor and side steps (inc. mezzanine step and saloon entry step), barbecue centre (combining electric barbecue, GRP sink with hot/cold faucet, garbage bin and storage underneath), drawer dishwasher, three opening round portholes in master cabin with alarm to helm, three-quarter rear awning, galleyware and bathware package, portside cockpit joystick, removable and folding teak cockpit table, and tender, cradle and outboard. Triple 600hp Cummins engines with Zeus pod drives (inc. electronic controls, joystick and Skyhook), electronics package, 5kW inverter integrated into power command system (with generator for AC supply to audiovisual systems, icemaker and freshwater pump), cockpit wetbar fridge underneath barbecue, Miele washer and dryer, Amtico saloon flooring, galleyware and bathware package, custom L-shaped cockpit lounge with storage underneath, fixed rear awning, portside cockpit Zeus joystick, open plan office (inc. table with bookshelf and overhead lighting), LED lighting, engineroom workbench cabinet with twin GPO, storage cupboards, shelves and fiddles above, freshwater system, CZone 8in touch-panel, galley water purifier, and tender and outboard. 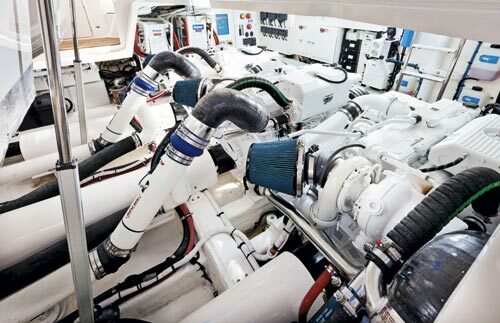 Three in a bed: Triple Cummins QSC 8.3 with Zeus pod drives (above) lined-up in the engineroom of the Riviera 53 Flybridge (below). The Zeus option has delivered more torque to the 5800 SY (above), which will show benefits under extra load. Note the tender garage frame (below, at top right) above the new engine placements. From Trade-a-Boat Issue 427, May-June, 2012. Photos by Riviera.